Why You Might Not: It is our opinion that fat blockers offer a better weight loss experience than fat binders. Our Opinion: Good product by a good manufacturer – but our opinion is there are better products that are more adept at tackling weight loss by utilizing more than just concentrating on fat binding. Nuvexa is a health and wellness product made by Flordis. 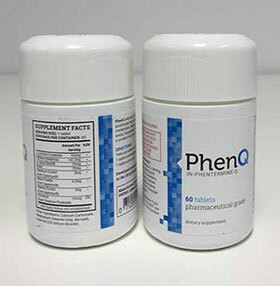 The company specialises in producing pharmaceutical grade natural medicines. Flordis Nuvexa is designed for healthy individuals who need to maintain healthy body weight and cholesterol levels. In reality, Flordis Nuvexa is actually a patented natural fibre product that offers a fat binding action. The product only has one key ingredient. It’s Alpha-cyclodextrin (FBCx). According to Flordis, a single Flordis Nuvexa tablet can bind up to 9g of fat. Each gram of fat consumed normally provides the body with nine calories. In theory, that means each tablet locks-in 81 calories preventing them from being absorbed. 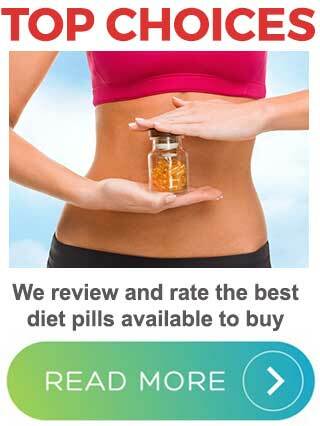 That means the recommended dose of six capsules per day should prevent the absorption of 486 calories. 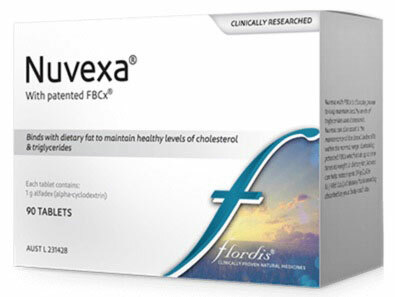 Cholesterol is also a fat, so it’s easy to understand how Flordis Nuvexa may support healthy cholesterol levels. What Is Flordis Nuvexa and How Does It Work? Flordis Nuvexa works in a similar way to other fat binders. When it’s taken with a meal that contains fat it absorbs some of the fat that it encounters in the stomach. The fat binder then prevents the bound fat from being digested. It leaves the body with the faeces. Chitosan and nopal can do the same thing. Both ingredients are more popular than Flordis Nuvexa and there is likely to be a good reason for that. Each tablet contains one gram of FBCx. It’s a natural fibre that comes from corn. There are no other active ingredients. The good news is, a number of studies suggest FBCx does the things it’s supposed to do. One study shows it works well for obese individuals with diabetes. Another shows the ingredient also works for non-obese, healthy people. Other studies are equally promising. The dose is two tablets three times per day. Flordis stress the need to take the doses with a meal that contains fat. If you are on a low-fat diet you will need to ask your doctor for advice prior to using Flordis Nuvexa. 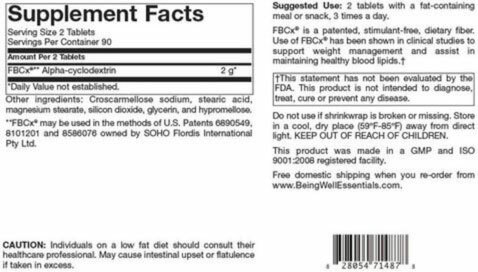 This is because using the product with a low-fat diet may cause gastrointestinal discomfort. It’s difficult to find any customer reviews for this product. I could only find four. One of them is by someone on her fourth month of using the product. She says her latest cholesterol test shows an improvement. The other three reviews are by people who see the product in a positive light because of fast delivery from their chosen pharmacy. Even if all the reviews were to mention positive results, four reviews is not enough to show how well the product works. The American FDA has classified FBCx as GRAS (generally regarded as safe). This being the case, the chances of side effects are likely to be minimal. However, fat binding products can sometimes be hard on unusually delicate stomachs. Potential side effects may include stomach discomfort and diarrhoea. People take FBCx alongside a low-fat diet may also experience mild stomach pain and gas. The Flordis Nuvexa marketing material fails to mention it, but the use of fat binders can lead to vitamin deficiencies. The vitamins A, D, E, and K are fat soluble. The body can manufacture Vitamin D when the skin comes into contact with sunlight, but deficiency is quite common. You have to get vitamins A, E, and K from dietary fat. If you use fat binding products the body is more likely to become deficient in the aforementioned vitamins. It’s possible to prevent this by using vitamin supplements, but Flordis does not offer this important advice. Flordis also neglects to mention the fact that people who use fat blockers while eating a high-fat diet may fall victim to explosive diarrhoea. Women who are pregnant or nursing a child are advised to obtain medical approval prior to using this or any other brand of supplement. People who have existing health issues should do the same. 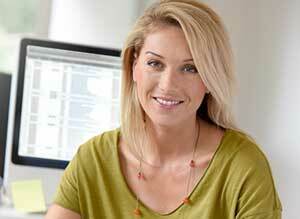 The Flordis website only provides information about the product. You can only buy it from third-party retailers including SuperPharmacy, Chemist Warehouse, and AustralianVitamins.com. It’s unlikely that the main ingredient used in Flordis Nuvexa will offer any additional value that chitosan and nopal do not, but research shows that it works. The problem with products of this nature is they have to be consumed with a certain amount of dietary fat. If you want to lose weight it makes more sense to reduce fat intake and follow a low-calorie diet. Forsaking a low-calorie diet so a fat binder has something to work upon does not make good sense. The best way to lose weight is to follow a sensible, low-calorie diet plan. Getting more exercise will improve results. According to the Mayo Clinic, such a combination is also good for controlling cholesterol. If hunger is a problem, there are many quality diet pills that can help, most of which speed up the metabolism and offer additional benefits. Flordis Nuvexa is not without merit, but the idea of eating fat to make it work is flawed.